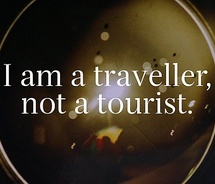 My epiphany was that I was a traveller (i.e. one who travels) but that was merely a description of an activity and nothing more. I was and would always be a tourist—a guest, if you will, in other destinations. Perhaps from a marketing point of view, there is some perceived benefit in making consumers feel elite as ‘travellers’ , as well as in subliminally suggesting that a tourist is one of those mass holiday louts who cares little for the destination or the people. The term ‘tourist’ is used disparagingly to suggest ‘you are not one of those…you are one of our clients”.